I didn't spend a lot of time in the workshop this weekend; however, I did spend a little time. I mentioned in previous posts how I added a miter saw shelf to my new workbench and I started making the shelves for my dresser. Additionally I took a little bit of time to fix my new workbench and to put a top on another set of legs I had lying around. Fixing the new workbench, what's up with that? 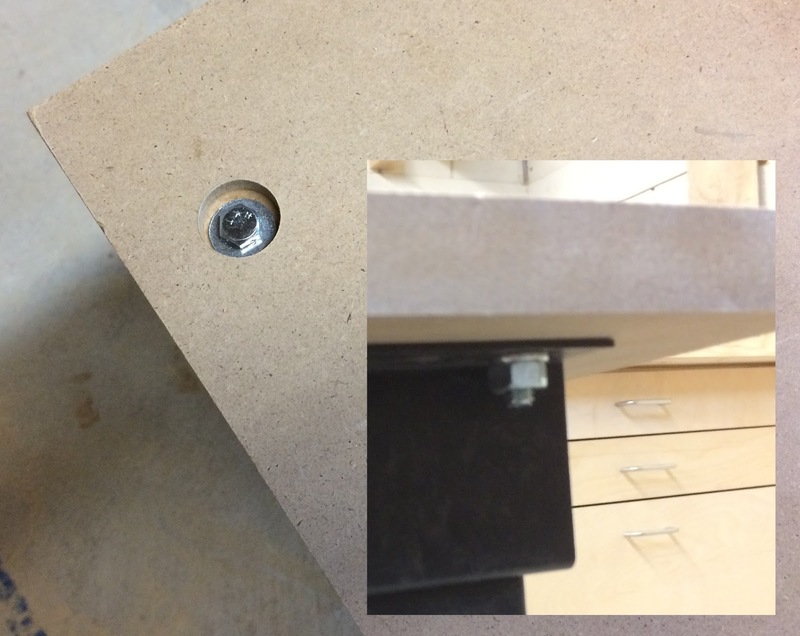 Well, if you were reading closely my previous post you'll remember that I tried counter boring the screw holes in the drawers and drilled them too deep in the first drawer. So this weekend I cut a couple of hardwood plugs and glued them in the holes. After the glue dried I used a chisel to trim them flush, re-drilled the holes for the hardware and attached the handle. It's not pretty but it is a workshop drawer. It's going to be perfectly functional. I've had these legs in my workshop taking up space for probably well over a decade. I'm pretty sure they came off a line-printer that was being disposed of at one of my previous jobs. It's a little low for comfortable work but it'll be useful as an occasional needs bench. I had a piece of MDF that I'd used for a jig that still had some double sided tape stuck to it. I trimmed off the tape-shmutz and trimmed the top to size then flipped the legs over and marked screw holes in the top to line up with holes in the base. 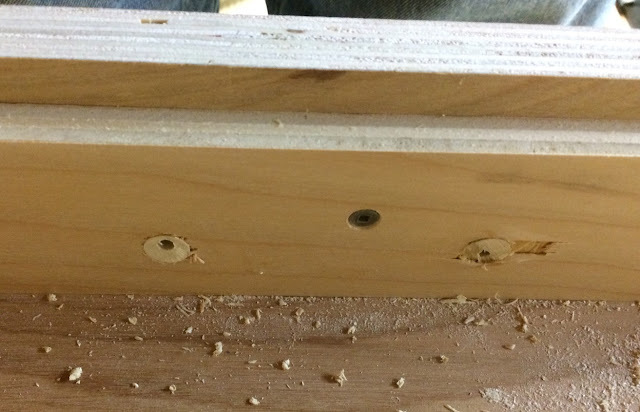 I drilled the countersink then drilled the through holes. I fastened the top using some nuts and bolts from my supply. I used washers on the top and lock-washers on the bottom. My friend - we'll call him John to preserve his anonymity - who knows a lot more about assembling machinery than I do has said that when bolting things together you should always use washers and lock-washers. 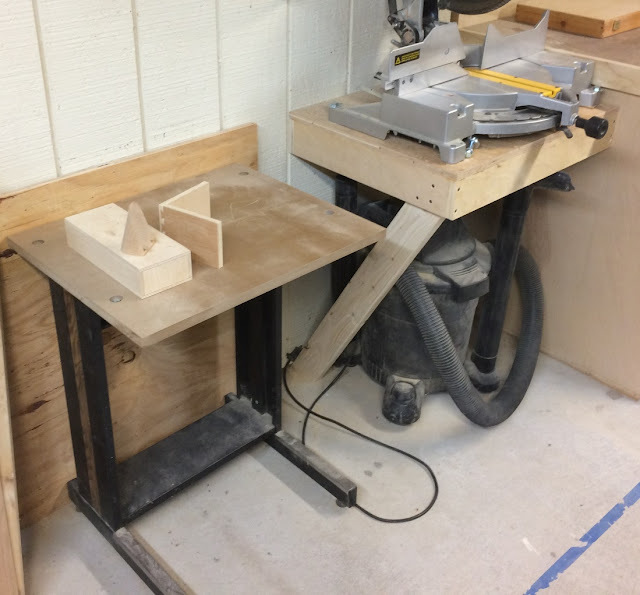 And here's the finished mini-bench tucked in next to my miter saw shelf. I'm not sure where it'll end up as a final location but this will do for now.